Brown cut-up chicken in a little oil with chopped onion, minced garlic and minced ginger. While the chicken is cooking, add eggplant and diced tomatoes, bay leaf and thyme, then a few dashes of Maggi sauce. Add chicken stock and put the lid on to simmer over lowest heat for about 45 minutes. Give the pot a shake a couple times, but don't take the lid off or worry about stirring it—you really want to just leave it alone. About 10 minutes before the end, add okra and let it finish cooking. The stew is done when the chicken is falling-off-the-bone tender. Serve with rice. As a fan of southern cooking, I naturally fell in love with African flavors. Many ingredients heavily associated with the South—black-eyed peas, watermelon, greens, sweet potatoes, okra and peanuts—were brought directly to the United States by slaves. Akara Similar to black-eyed pea fritters in the South, the West African akara is a simple and delicious bean fritter, and a wonderful introduction to African cooking. Cooked and mashed black-eyed peas (also called cowpeas), onions, sweet peppers and a little salt and pepper are formed into patties and fried in oil, then eaten as breakfast, a snack or an appetizer, or maybe on the side with chicken-peanut stew. They're perfect with hot sauce or a sweet pepper chutney (minced yellow and red bell peppers and a cayenne chili slow-sautéed with onions and a pinch of cinnamon and ground cloves, a splash of vinegar and a little salt and sugar). Irio Greens such as collards or Swiss chard can be braised simply in a splash of vinegar (I use the vinegar from my red onion pickles) with ginger and onions until the greens are tender. Or they can be cooked with tomatoes and peanuts to make a vegetarian stew to eat with rice or millet, steamed with fish, or combined with lima beans, corn, potatoes and peas to make a sort of East African succotash called irio. Chicken and Peanut Stew A stew of chicken and peanuts (called groundnuts in Africa) is probably one of the best-known African dishes, and this is probably because it is cooked throughout most of the continent south of the Sahara. It’s made by stewing cut-up chicken in a stock enriched with chopped tomatoes, bell peppers and peanut butter, with ginger, onions and hot chilies to add flavor. 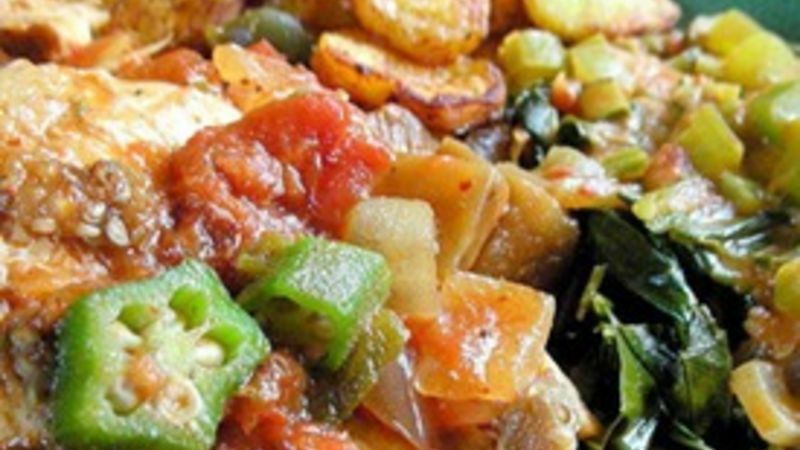 A vegetarian version can be made without the chicken, using classic African vegetables such as eggplant, sweet potatoes and okra. Being at the heart of the spice trade, African cooks have at their disposal ginger, cumin, cardamom, pepper, cinnamon, curry and cloves, along with many other Asian spices. Many African dishes are flavored with pepper, cumin, ginger and chilies. Kedjenou Another chicken stew that I make quite a bit at home is kedjenou, from the Ivory Coast. It's fast, healthy and delicious. African flavors work no matter what the season. You might not think of a plate of stew as being summer fare, but I think I'll take a lesson from those living in the hottest parts of the world. Next time you’re thinking about a nice stew, or roasting a chicken, or craving a spicy curry to get the sweat flowing, why not mix it up a bit with African food?